Meanwhile, in a medium sauté pan, heat about 1 T. olive oil. Add about 1/8 C. chopped onion and cook until tender and translucent. Add 1 clove chopped garlic and let cook 30 seconds. Add 1 diced zucchini and sauté 2-3 minutes tossing ocassionally until just tender. Season with salt and pepper and remove from pan and set aside (Try to get everything out of the pan). Add 2 T. Butter and 3 mint leaves to the same pan and cook over medium-low heat until butter foams and turns light hazelnut in color. Be careful not to burn. 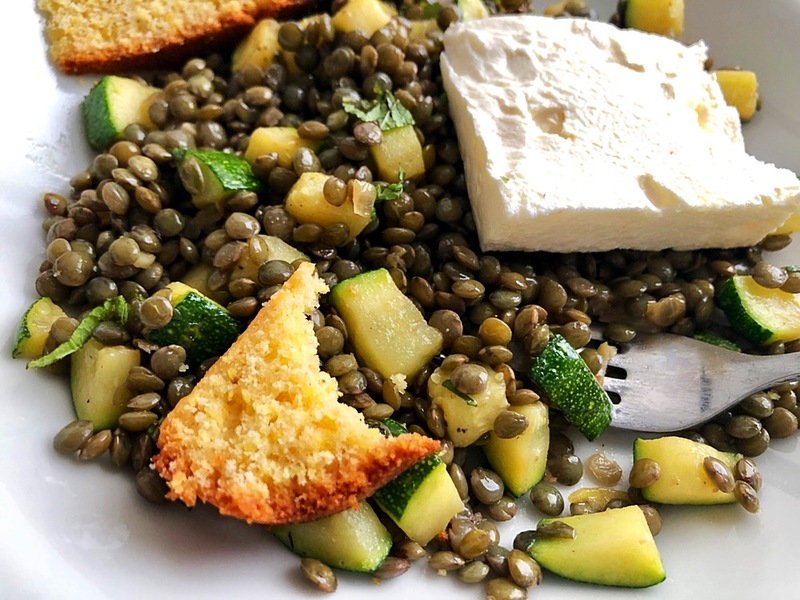 Remove mint leaves and add cooked lentils and zucchini back to pan. Taste and season with salt and pepper. Add a few shavings of lemon zest (about 1/4 lemon) and additional chopped mint. Stir and taste. Serve with big chucks of feta cheese and slices of cornbread, if desired, for a delicious sweet and salty combination.